An ever evolving entity, Death Metal, is a sub genre as tenacious as it is revolutionary. Formed of the likes of the most classic of bands to the newly appointed leaders, its scope is perhaps in 2017 wider than ever. Having cut their teeth for seventeen years The Black Dahlia Murder are caught somewhere between the two. With their old soul and new delivery, the band are rewriting Death Metal once stroke at a time. Now on their eighth canvas, their most ambitious to date, Nightbringers proves that they are at the pinnacle of the Death Metal chain. Releasing Abysmal in September 2015, following their first tour announcement it was revealed that guitarist Ryan Knight would be stepping down from the band. Unbeknownst to us, we would be seeing his permanent replacement, Brandon Ellis fill in for him on the band’s European leg of the Abysmal tour. Performing throughout 2016 all over the world, The Black Dahlia Murder were gaining ever more popularity in the world of Death Metal. Nearing the end of 2016 the band knew that they would be heading towards their two year mark, assuming a new album would be put out owing to their relentless release schedule. Announcing their headline spot on The Summer Slaughter tour, it was only then that we would hear bubbles of enthusiasm surrounding the band performing a “brand new song” as the grand finale following their run through of Nocturnal. Ending the tour in fantastic style the scene was unleashed into the world of Nightbringers, The Black Dahlia Murder‘s eighth studio release and their most ambitious to date. Having been a fan of the band from the very beginning believe me when I say this could well be their finest hour, their magnum opus, their coup de grace. Featuring the likes of new guitarist Brandon Ellis on the record, saw the rest of the band step up their game technically. Forever influenced by the gruesome topic of Horror, this combination of new blood and old soul fuelled a catalyst for the best material the band have written in long time. The Black Dahlia Murder’s brand new album Nightbringers is out October 6th via Metal Blade. Pick up a copy right here, right now! This album is going to change the world. It’s going to conquer religion. It’s going to bring us all together. 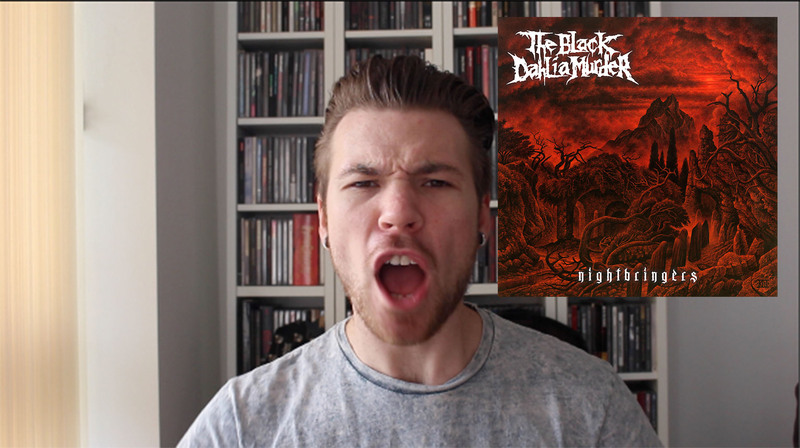 Nightbringers is something different and its a new era for The Black Dahlia Murder.